10.05.2013: Monza – Free Practice & Qualifying Practice 1. BMW Motorrad GoldBet SBK Team Rider Marco Melandri #33 (ITA). Monza – Free Practice & Qualifying Practice 1. BMW Motorrad GoldBet SBK Team Rider Marco Melandri #33 (ITA). Weather conditions: Rain until the afternoon, then some sun. 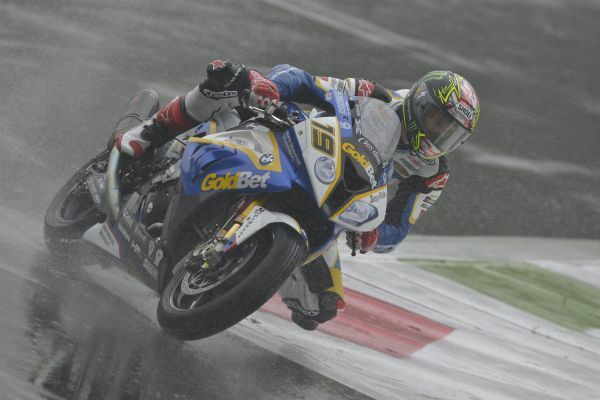 In tricky conditions, the BMW Motorrad GoldBet SBK Team secured provisional pole-position for its home round at Monza (ITA). The iconic “Autodromo Nazionale” hosts the fourth round of the 2013 FIM Superbike World Championship. 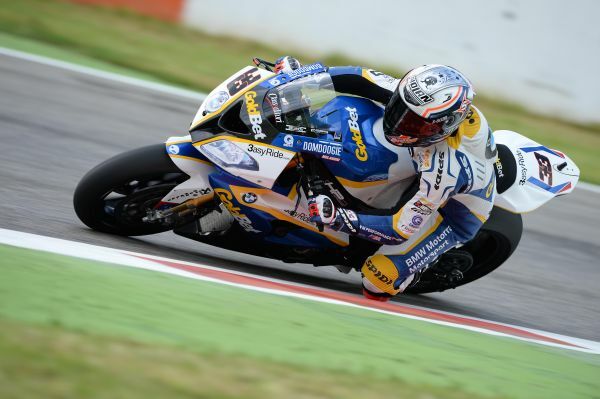 Factory rider Marco Melandri (ITA) set the fastest time in today’s first qualifying practice on his BMW S 1000 RR. His team-mate Chaz Davies (GBR) was also on course for a top position, but for him the qualifying practice came to an early end when he crashed 15 minutes into the session and was classified 13th. The day started with rain and during the first free practice at noon, both Marco and Chaz did not risk too much in the wet conditions and used the session to gather information. Marco returned to the garage after three laps and Chaz completed seven laps in the rain. In the afternoon, the sun came out and the surface dried for qualifying practice. However, the riders needed to be patient before they could go out on the track again as a delay in the schedule meant that the first qualifying practice began one and a half hours later than planned with parts of the circuit still damp. In the FIM Superstock 1000 Cup, BMW Motorrad GoldBet STK Team’s rider Sylvain Barrier also secured provisional pole-position with his BMW HP4, being fastest in the first qualifying practice with a gap of more than seven tenths of a second to his closest rival. His team mate Greg Gildenhuys (RSA) was 15th. “It is great to be back at the top. Today I had such a good feeling on the bike which I haven't had for a long time, I am so happy. In the team, we are doing such a great job and I think we now really understand what went wrong at the beginning of the season. We struggled with the front part of the bike. It was not absorbing the bumps and it was difficult to turn, now this is much better. Of course, we still don't have the perfect set-up, because 30 minutes track time in the dry is not enough. But we are starting from a good base and that means that we can fight for a good position at the end of the weekend. Now we just need to try to keep working and to set the RR up for the race distance and Superpole tomorrow which is also important. “It has not been a particularly productive day. The rain was one thing and the delay another, but a crash so early in the weekend is frustrating. The track was probably not completely clean. I lost the front but I saved it, but then I think I hit some bumps and the front went again. Serafino Foti (Sport Director BMW Motorrad GoldBet SBK Team): “Despite the unstable weather, the weekend has started off quite well. Marco is back at the front after finding the right feeling with the RR. He is now able to ride to his full ability and we are very happy because finally he is starting to smile again. After Assen, the team analysed the data and worked hard and we are confident that we have found the right way to move forwards. I am sorry for Chaz, who crashed and could not improve. Chaz was quite satisfied with the bike but unfortunately he slipped and lost the front. This can happen; it’s part of racing. Tomorrow he has time to improve and put in a good qualifying session. Andrea Dosoli (Technical Director BMW Motorrad GoldBet SBK Team): “It was a difficult day due to the changing weather conditions. With Marco, we are satisfied with the job we have done. He has started off on the right foot this weekend and already has a clear understanding of what needs to be improved for tomorrow. It is just a matter of fine tuning the electronics, the gearbox and the chassis. We are sorry for Chaz. His initial feeling for the bike was fine and he was improving, but unfortunately he had a big crash in the first of the ‘Lesmo’ corners when he lost the front.